Designed for a young family in the suburban area of Rondebosch, Cape Town, this house sits on an elongated site with views towards Devil’s Peak and The Back Table, which is the south-eastern edge of the iconic Table Mountain. 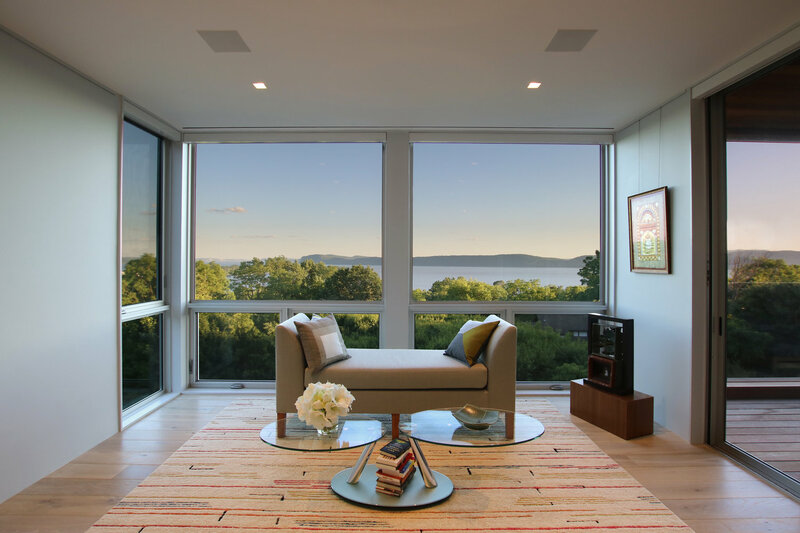 The client’s brief called for a contemporary, open plan home that provides a relaxed lifestyle and takes advantage of the site and its views. ​The resultant form is a minimal white box containing the bedroom accommodation on the first floor, hovering over the living spaces on the ground floor below. This box was articulated with strategic openings maximising views and exposure to light, with a central courtyard carved out adjacent to the kitchen and dining room to create a focal point. The mass of the floating box is broken down on the street façade with a dramatic screen wall which creates an open-air terrace for the guest wing of the house. The screen offers privacy from the street while allowing views and light to permeate and is constructed from standard pre-cast concrete breeze blocks reminiscent of a bygone era. 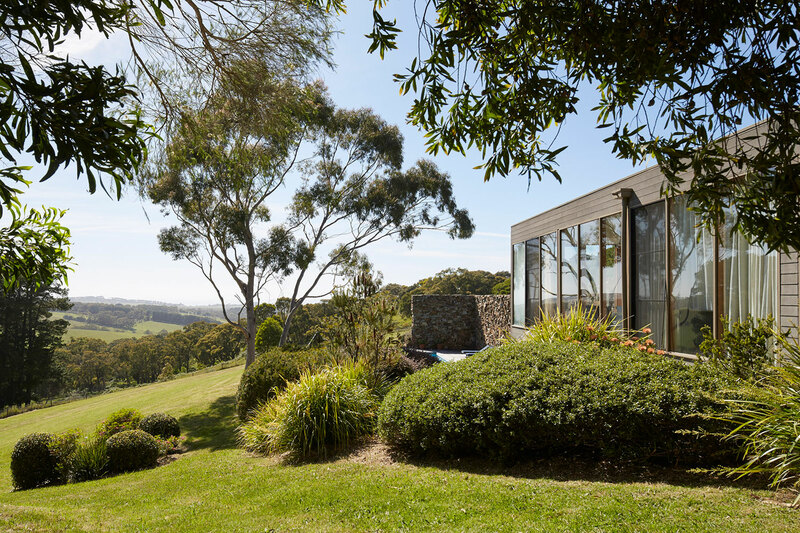 The open plan living spaces on the ground floor spill out onto the courtyard and terrace to the North, with the garden and mountain views to the west. A hand selected tree was planted in the courtyard as a focal element to provide a shaded garden area that fills the adjacent spaces with dappled light. The tree acts as a natural screen to the direct north light and its canopy creates privacy for the first floor from neighbours. The steel and timber stair connects the two levels and arrives in a large open plan utility space on the first floor which separates the guest wing from the master suite and maintains connections to the courtyard and tree below. Circulation spaces were minimised and were all arranged with external views on axis. A simple pallet of materials allows space, light and volume to take preference over decorative finishes and elaboration. 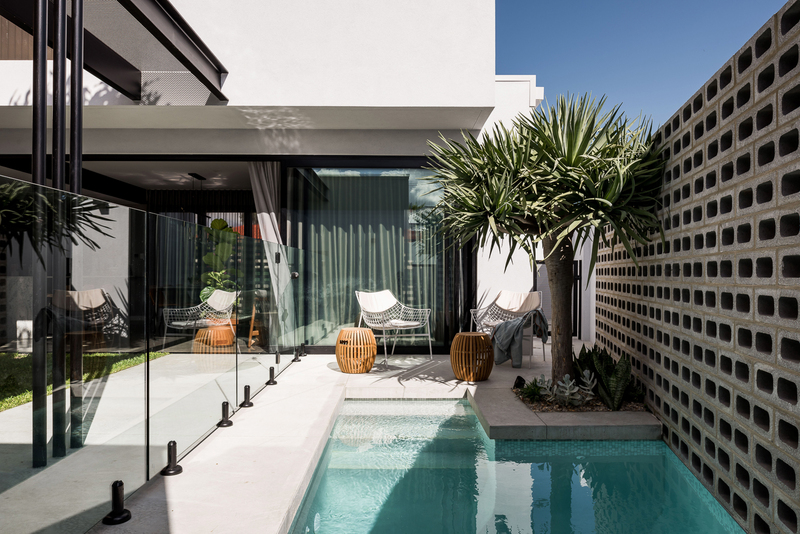 The ground floor has a monolithic polished concrete floor finish throughout which blurs the threshold between indoor and outdoor living capitalising on the South African climate. 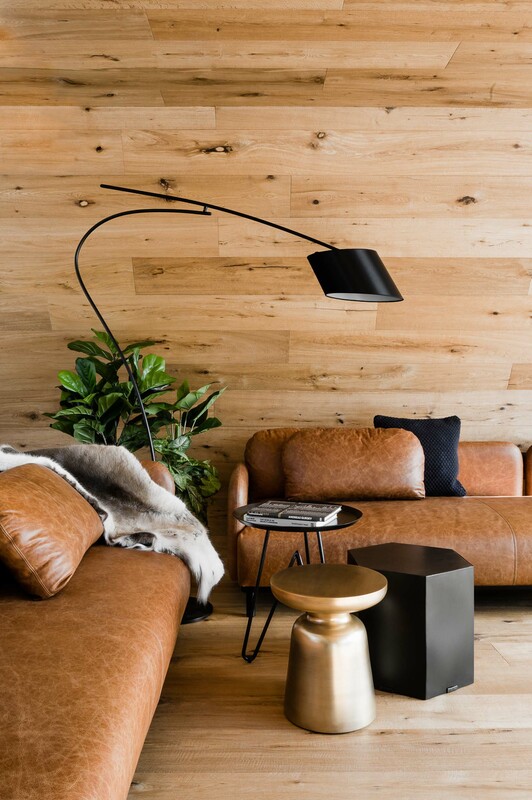 Upstairs, solid hardwood timber floorboards and natural limestone tiles create warmth and texture for the more intimate spaces of this home. 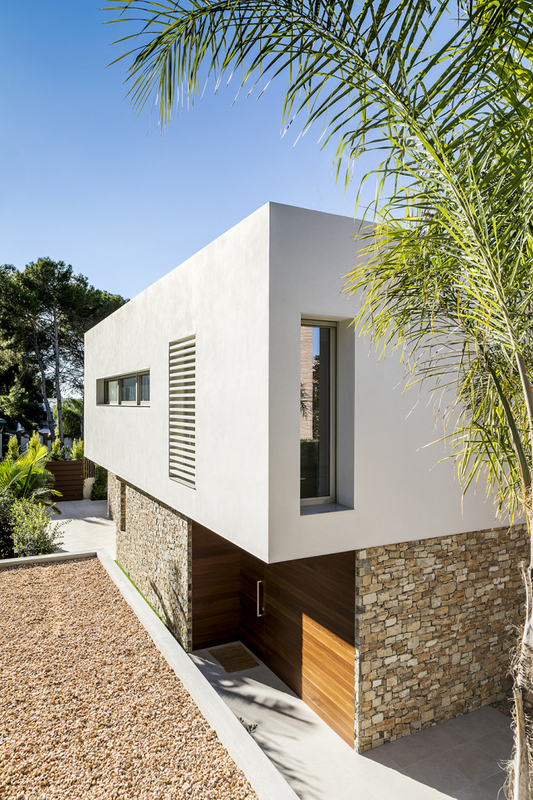 Rough off-shutter concrete elements were used on the street boundary and the courtyard façade accentuating the white box through textural contrast. 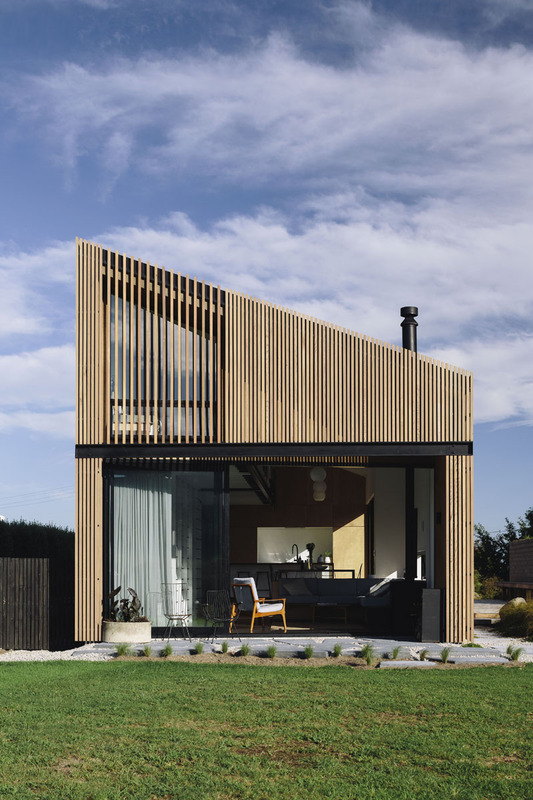 This light-filled home, completed on time and within budget, successfully translates the clients brief and is a carefully considered response to the climatic and contextual conditions of the site. The client’s willingness for a bold conceptual design has resulted in a strong contemporary form uncommon to Rondebosch. 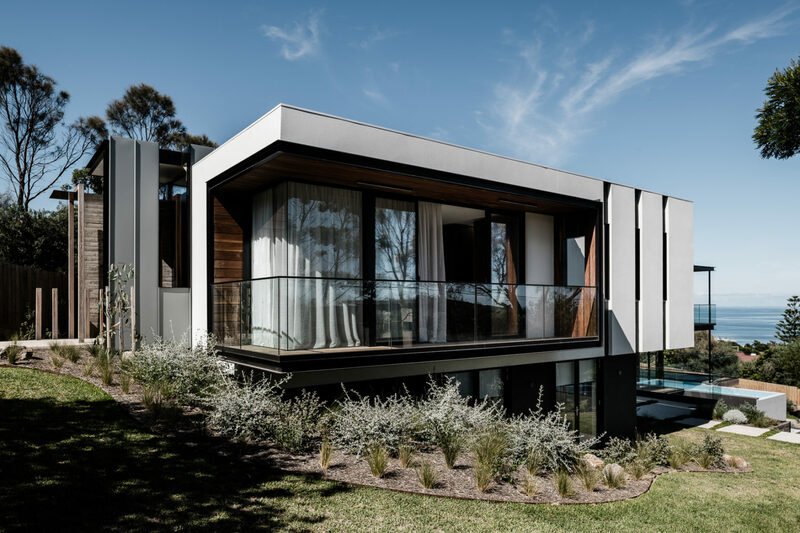 This aesthetic challenges the surrounding, traditional urban fabric and encourages a fresh approach to residential architecture in this suburb. Three14 Architects, founded in January 2008, is an award winning studio of creative architects based in Cape Town, South Africa. The focus on designing exclusive luxury homes for discerning clients – bringing fresh ideas, rigorous detailing and creativity to the residential arena – results in elegant and sophisticated homes that are easy to live in. The office consists of a small, hands-on team taking on a limited number of projects per year. This enables both principal architects to be involved in each project from inception through to completion ensuring an efficient and thorough level of service and a highly considered and always unique end product. Kim was born in 1979 in Harare, Zimbabwe. He graduated with a Bachelor of Architecture from UCT in 2005 and is a founding partner in Three14 Architects. Sian was born in 1982 in Johannesburg, South Africa. She completed her undergraduate degree at UCT in 2002 and then went on to do her Bachelor of Architecture Honors and Master of Architecture at the University of Witwatersrand. Sian is a founding partner in Three14 Architects.